About 71⁄2 (81⁄2, 91⁄2)" (19 [20.5, 24] cm) foot circumference and 81⁄2" (21.5 cm) from back of heel to tip of toe. Oregon’s Willamette River valley is the site of thousands of lightning strikes every year. 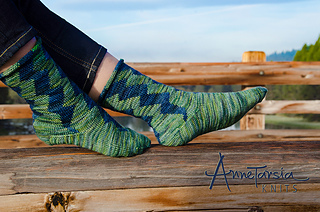 These socks feature a lightning-bolt motif and simple rolled cuffs (your links will peek out and reveal your magic powers!). 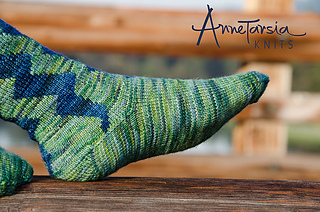 With the exception of the toes, all sections of the socks are charted. Note that three of the lightning bolts end at the heel, but one crackles all the way down the instep. Pay careful attention while working the Ankle and Instep charts, in which there are irregular changes in the turning point, and some increases are worked on wrong-side rows. Leave your work turned inside-out while working the intarsia sections, and your knitting will flow! 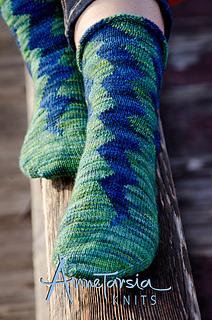 ERRATA: Cast on using yarn B (bolt yarn)! “M” (make one) increases in Ankle chart are purled thru back loop in WS rows.